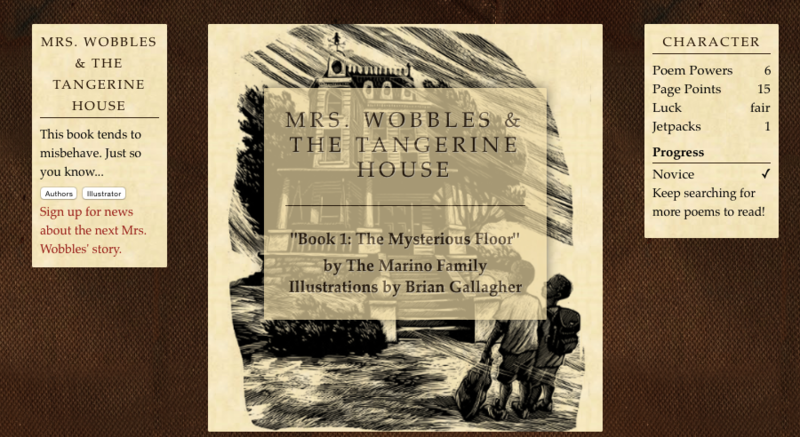 Mark Marino and The Marino Family: Mrs. Wobbles and The Tangerine House http://markcmarino.com/mrsw 2013-2015. This anthology of interactive children’s stories is designed for middle grade readers. The stories grow out of a magical foster care home run by a woman who may or may not be a witch. These choice-based tales combine textual narrative with game-like options, and are digital descendents of the Choose-Your-Own-Adventure gamebooks that became popular in the 1980s. The progress points in the sidebar also encourage a playful style of reading. The stories are full of humorous situations and offer children the chance to make tough choices and help these foster children through their adventures and in the process heal old wounds. The Mrs. Wobbles stories are written by Mark Marino in collaboration with his ten-year-old daughter and eight-year-old son. Illustrations are by Brian Gallagher. Denne samlingen med interaktive fortellinger er skrevet for barn som kan lese selv, og kombinerer humoristiske, fortellende tekster med valg og spill-lignende elementer, som poesipoeng og nivåer. Fortellingene kretser om Mrs Wobbles, som kanskje er heks og som styrer et magisk fosterhjem for barn. Gjennom valg kan leserne hjelpe fosterbarna gjennom eventyr og helbrede gamle sår. Fortellingene er skrevet av Mark Marino i samarbeid med hans åtte- og tiårige barn. Brian Gallagher er illustratør.